Just checking in with another card today! Hope you all had a wonderful weekend. As I’d promised I have a cute Birthday card to share which features a bird. A bird from Tim Holtz new Bird Crazy stamp set. The set comes with six of the craziest looking birds you’ve ever seen. I absolutely fell in love with this stamp set the first time I saw it. I think it was the expressions on the birds faces that sold me. The fact that you can also get the coordinating die set and the coordinating accessories set called Crazy Things was just another bonus. I also just noticed today that they have the thinlets dies for the Crazy Things as well however, it is on reserve until Oct 31st at Simon Says Stamp. 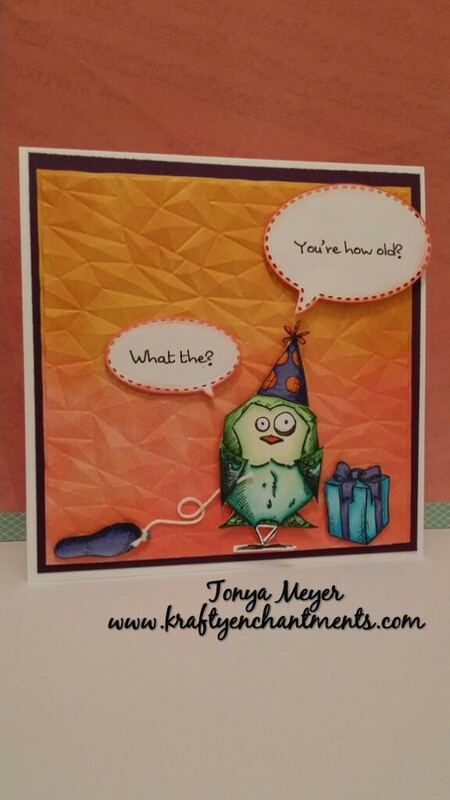 So to create my card I first selected and stamped the little party hat from the Crazy Things collection. I stamped it on a piece of post it tape and fussy cut it out to create a mask and set it aside. Then I selected my favorite bird from the Bird Crazy set. I actually stamped it onto a Post-it note for positioning purposes. Next I cut a small piece of Neenah card stock. I placed my Post-it note with my bird stamped on it onto the cardstock to help with placement of the party hat. Once I was satisfied with the angle and height that the party hat needed to be, I removed the Post-it note and stamped the hat onto the cardstock. Next, I grabbed the party hat mask I’d cut out and placed it into position over top of the hat I’d stamped onto my cardstock. Once that was done I was able to ink up my bird and stamp him in place so that it would appear he was wearing the hat. Once the party hat mask was removed I was all set to color him up. I used my Copic markers and selected shades of teal blue and green leaving his middle a lighter shade and then colored his hat with some vibrant purple and orange. 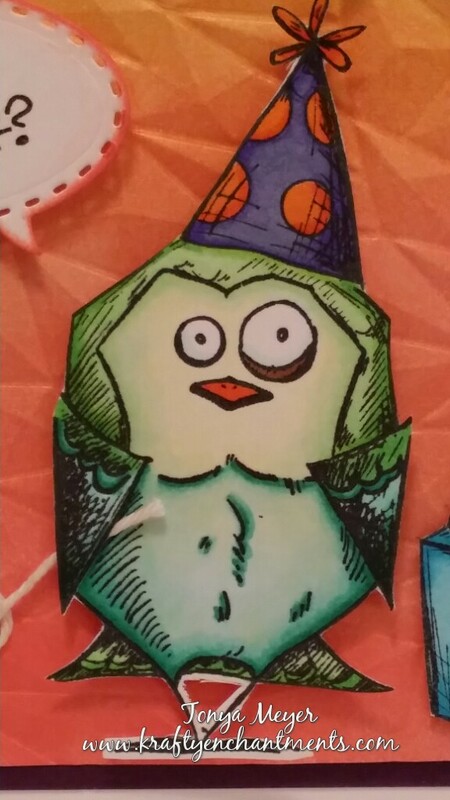 Bird Crazy stamp and party hat from Crazy Things colored with Copics. Once he was completely colored and I’d also colored up a sort of flat looking balloon and a package from the Crazy Things set, I set them aside for nearly a week while I tried to decide what I wanted to do with the rest of the card. I’d seen a technique that Jennifer McGuire had used over on her blog. She’d said that she used this technique for creating a faux textured metal paper when she was low on her mojo. I was intrigued by it and really wanted to try it. I had all of the items needed so I thought I’d dive in.. I started by cutting a 7 x 7 piece of Neenah Solar White cardstock and I used my Post-it Tape to mask around all four sides, lining it up with the outer edge of my cardstock. Then I selected some Ranger Distress Inks in Spiced Marmalade and Abandoned Coral. I sponged the ink on generously starting with the Spiced Marmalade at the top and then came in with the Abandoned Coral from the bottom making sure to cover all of the white areas of the cardstock with ink and blending the two colors together really well where they met in the middle. Once my masked section was colored I applied some Perfect Gold from Ranger’s Perfect Pearls Metallic set over the entire colored section. (A word of caution, you will have a really fine layer of glitter over everything that is in the vicinity when you use the Perfect Pearls so make sure you cover your workspace really well). My craft space and my keyboard are still sparkling, LOL! After applying the Perfect Pearls I took a Kleenex and gently wiped over the cardstock to wipe away any excess powder and then I carefully removed the Post-it masking tape and cut my cardstock down to 6 x 6 so that it would fit perfectly in my embossing folder. To emboss it, I used on of the We R Memory Keepers Next Level folders called Gemstone. It creates a cool, deeply faceted look to the paper. I placed my cardstock in my embossing folder and ran it through my Evolution Advanced machine. Once I had my background it was easy to assemble the card using my colored bird and accessories. The only thing that I was missing was a sentiment. 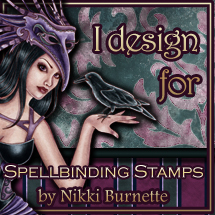 I’d previously ordered the Crazy Talk sentiment set that goes with the birds, but unfortunately the supplier was unable to ship it because the demand for these stamps is so high right now they couldn’t get enough from the manufacturer to fulfill their orders. So I had to improvise for my sentiment a bit. I wanted to use the What the? and the You’re How Old? sentiment from that set so I just typed them up and printed on some plain white cardstock and die cut them out with my Spellbinders Word Bubbles 3 dies. Not quite the same as having the actual stamps, but it worked in a pinch. I added a little Spiced Marmalade ink around the edges of the word bubbles. I cut a layer of purple cardstock 1/4 inch larger than my embossed background and layered it onto a card base of Neenah Solar White cardstock that was 6 1/2 x 6 1/2. 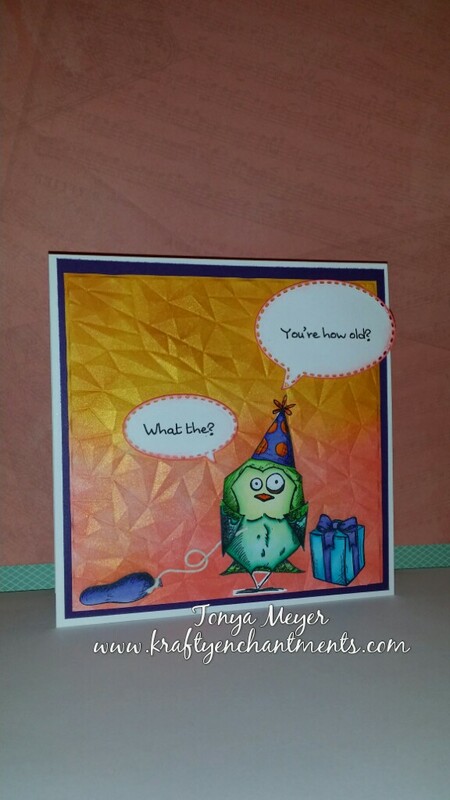 Layered my embossed background on top of the purple and put some dimensional foam on my cute little bird with his balloon and package. I then tied a piece of bakers twine from the end of the balloon and tucked it into his wing to appear as though he was holding the balloon. I also added some foam to my sentiment bubbles and placed them on my card. Hope you have a great week! Thanks for stopping by. Your blog love and comments are much appreciated!